Open from Friday 16.11. to Wednesday 26.12.2018. 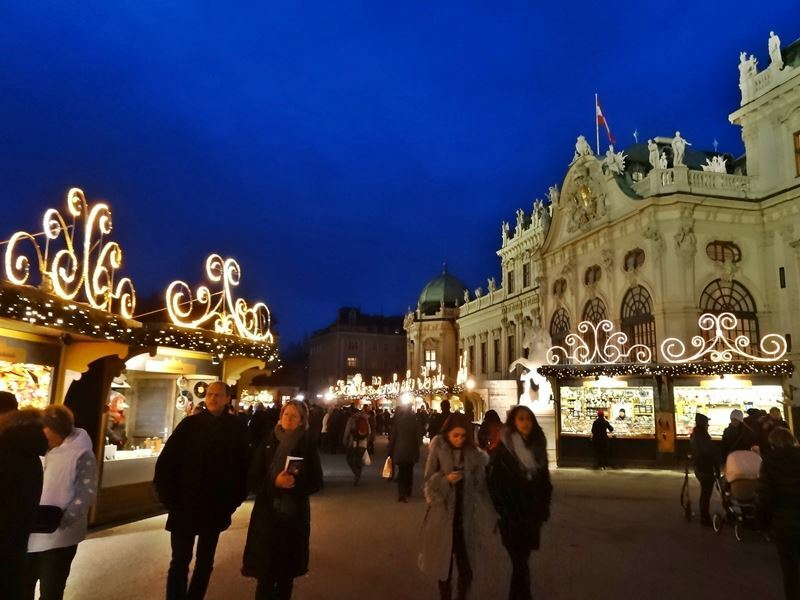 The popular Christkindlmarkt, the Christmas illumination and the Ice Dream in the Rathauspark should be visited from all tourists in Vienna during the advent season. Accordingly you need to be prepared for crowds of visitors. Like at all mentioned markets there is no entrance fee. Sightseeing Tip: Do you want to visit some sights without watching at the prices all the time? The City Cards Review shows you how you can save some money on sightseeing. Open from 21.11. to 31.12.2018. This well visited Christmas market is embedded between the magnificent Museum of Art History and the one for Natural History. In the center you can see the huge Maria Theresa Monument among several stands which offer art work or punch in all variations. From 27th till inclusive 31st December the place transforms into a New Year's Eve Village. Tip:For a download click at the Tour Map on your right mouse button and choose -Save Target As.-. Open from 23.11. to 23.12.2018. 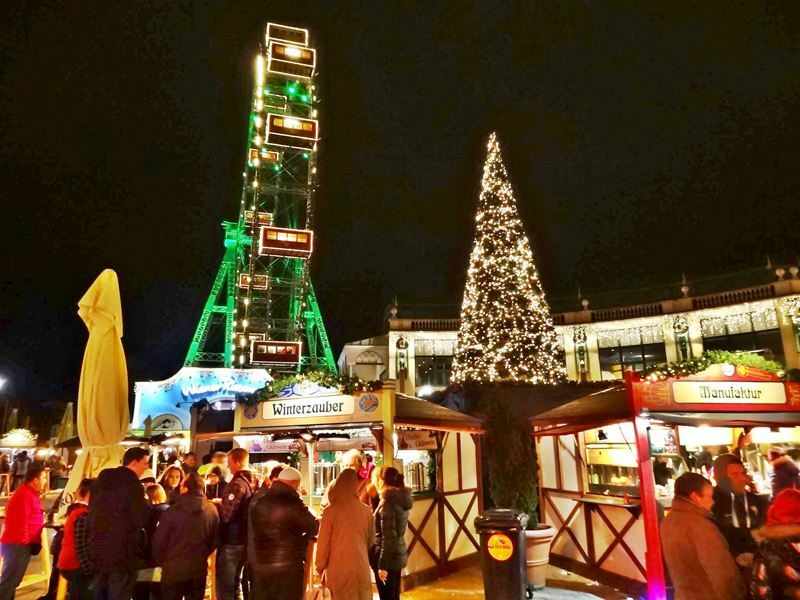 This advent market is located directly in front of the huge Karlskirche and offers rather simplicity then colorful Christmas illumination. Usually there are also some attractions for kids like pony trekking and show workshops. Open from 17.11. to 23.12.2018. The best description for this market is quite sure "small but excellent". At the very well-kept stands you get besides art works several gastronomic specialties offered. Open from 16.11. to 23.12.2018. The Christmas Market Am Hof is sponsored by a local radio station. Here you can find a broad offer at a large number of stands which all have a clearly arranged sign. Open from 8.11. to 23.12.2018. This is the place to enjoy the advent season in a hip way. Among other things there are futuristic designed pavilions were hot punch is served and cool music is playing. Open from 16.11. to 26.12.2018. Due to the unique location in the center of the inner city you can find here also masses of people. But in return you are able to have a look at the Christmas lighting of the Haas Haus and the Stephansdom while warming up with a hot drink. Open from 15.11. to 23.12.2018. 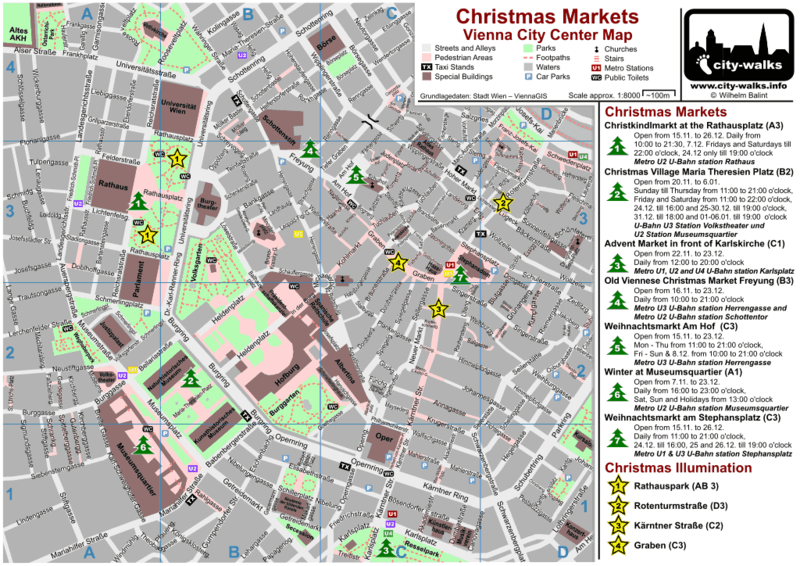 The market spreads mainly over 3 narrow alleys: Schrankgasse, Spittelberggasse and Gutenberggasse. These romantic alleys are perfect suitable for walk in the advent season. Open from 24.11.2018 to 6.01.2019. Through the main gate at the Schönbrunner Schloßstraße you can enter the spacious square in front of the Schönbrunn Palace. Even there is a huge rush, normally you should be able to drink your hot punch and adore the splendid scenery without getting claustrophobia. Open from 17.11.2018 to 6.01.2019. This market gives you every day the chance to drink your Punch with a view at the romantic illuminated Giant Ferris Wheel. On Thursday, Friday and Saturday you get additionally into motion with some free live music performances on a big stage at the Riesenradplatz square. Hotel Tips: Where do you get a cheap but comfortable room? Have a look at the 7 hotel recommendations from city-walks located nearby the center. The uniformly designed sales huts are placed directly in front of the imposing building of the upper Belvedere Palace. They offer many nice small Christmas presents and of course also the usual hot drinks and delicacies for the cold season. On weekdays and with a bit of luck even without a big rush. International and Austrian choirs perform in the impressive ballroom at the Viennese town hall which you can reach by the entrance at the Lichtenfelsgasse. Several wind orchestras from Austria perform daily directly at the Christmas tree in front of the city hall.